The Model DXS-31 Supervised Door/Window Transmitter is a battery powered stationary transmitter designed for use with Linear’s DXS and DX format receivers. This transmitter can be used in a variety of wireless remote control applications. Triggering the transmitter with its built-in magnetic switch, an external switch or an external glass break detector sends a digitally coded wireless signal to its companion receiver. The digital DXS code format features over a million possible codes. The DXS transmitters are precoded at the factory to unique codes, so no field coding is required. The DXS-31 can send four different codes: alarm, restore, low battery and status. 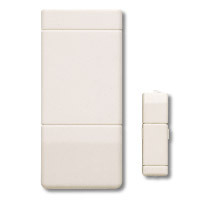 In a typical installation, the magnet is mounted on a door or window and the transmitter is mounted on the frame. When the magnet moves more than 1/2″ away from the transmitter, an alarm signal is sent. When the magnet returns next to the unit, a restore signal is sent. Alarms and restores can also be sent from external contacts wired to the terminal block. Pressing the case sends a test transmission that updates the receiver to the current state of the contacts and lights the test indicator.